Inescapable produced by RibbitRePublic is the fast-paced winner of best script at The Orlando Fringe Festival. 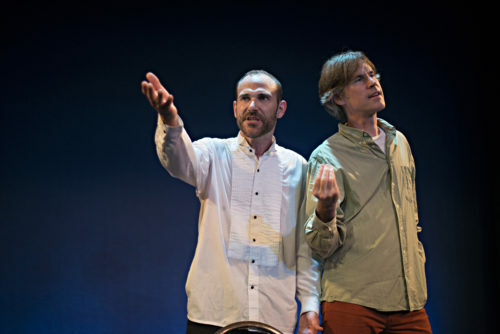 It features an amazing pair of actors, Jon Paterson and Martin Dockery and is currently playing in the Tarragon Mainspace at the 2018 Toronto Fringe Festival. Set in a room just outside a holiday party, it was only appropriate that upon entrance to the Tarragon Mainspace that Christmas music greeted audience members. Little did anyone know, however, what we were about to see was so perfectly intricate, witty, and well rehearsed. Paterson and Dockery, from the moment the lights came up, were a match made in heaven, providing each other plenty of energy to build off of. The acting prowess of Martin Dockery was staggering from the get-go as his quaking movements, and panic-ridden states made you feel for the guy, but also smirk a little. His comedic timing was so natural that even the most hard-hitting line could make you chuckle. Even sometimes working himself up to a sweat gleaming red face, this actor brought his A-game from the moment the lights came up to the final blackout. With his character speaking his full truth throughout, Dockery never held back as sometimes nonsensical monologues spewed out of his mouth at Paterson. What made this duo so compelling was Paterson’s ability to take whatever was being thrown at him by Dockery, and deliver a beautifully written line right back at him. The script was repetitive but brilliant in its anecdotes and subtleties. A short, 45-minute piece, so rich in the story’s ability to get across the kind of lives these men lived and what their aspirations were. Jon Paterson matched Dockery every step of the way with just a little more logic, but still plenty of wacky lines. Particularly, Paterson’s realization of the meaning of what he finds written on his hand at the beginning of the show was hilarious. Structurally, having a show that keeps looping back through a conversation over and over again has the potential for a variety of problems. Inescapable was presented in a way where each loop started again so smoothly that it took a few lines to realize that the scene had, in fact, started all over again. Not only that, but each loop of the character’s conversation was presented either in a new order, with new material, or in different words, keeping the show feeling fresh. Director Vanessa Quesnelle has a lot to be proud of with this piece in regards to direction and design as everything about it felt natural. From the simple staging of a table and chairs and the choice for them to have plain costumes, every choice made complete sense. The lack of complete stage coverage drove the pace even more, making for even more hilarity. Leaving the theatre with a huge smile is always the mark of a great show as Inescapable undoubtedly provided more than a few laughs. If you enjoy comedies, this piece should be on the top of your at the 2018 Toronto Fringe Festival. This venue is accessible. Assisted hearing devices are also available.